This unique experience will be available to less than 50 riders per year, and only offered through Celtic Horizon Tours and our service provider, Eaglerider. Start off your Route 66 guided tour with two nights in Milwaukee to visit the Harley-Davidson Headquarters, and to enjoy a private, VIP experience at the Harley-Davidson Museum! You will spend two nights at the incredible Iron Horse Hotel right next to the Museum, you’ll visit the tiny shed where Mr. Harley and the Davidsons built their first motorcycles; all capped off by a one-of-a-kind Museum Experience. And if that’s not enough, you still have an incredible journey down The Main Street of America, Route 66, to look forward to. 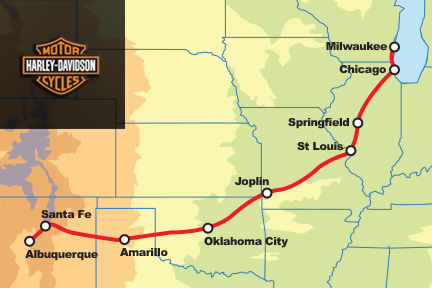 Route 66 in and of itself is the journey of a lifetime for most riders. Welcome to Milwaukee, the birthplace of Harley-Davidson, and one of our favorite Great Lakes cities. We will help you with transfers from the airport to the Iron Horse Hotel in Downtown Milwaukee. Once everybody is settled, we will meet up with the rest of the group for visit to House of Harley-Davidson to do a little shopping, before a fun dinner and night out at one of our favorite local restaurants. We will grab a great breakfast at Iron Horse before making the short van trip to the H-D headquarters where we will be greeted by some of the Executives and Leaders of The Motor Company. We will then have the opportunity to shop in the H-D Corporate Store, an experience that is typically reserved for employees and partners. This is the only place in the world where you can purchase a Harley-Davidson t-shirt with “Juneau, Wisconsin,” the street the HQ sits on, as the location. It’s a pretty safe bet you will be the only person in your riding club, or even in your home city, that has the coveted “Juneau” t-shirt. Next we will make our way over to the H-D Museum for a truly VIP, behind the scenes experience. There is a lot to see in the Museum, so feel free to spend as much time as you like. It’s only a ten minute walk back to the hotel, where we will have a meetup planned for later than evening. Today, we grab our Harleys and make the easy ride along the shores of Lake Michigan to the start of Route 66 in downtown Chicago. We will meet up with another EagleRider Route 66 group that is starting their journey in Chicago for a fun night out on the town, and maybe ribbing them a bit about how we just got to spend two days as VIPs in Milwaukee with Harley-Davidson! Tomorrow, we begin our 14 day journey down historic Route 66! Try to get up early to walk across the street today and enjoy an early morning view of the St. Louis Arch and Mississippi River before we hit the road. We quickly leave the city in mirrors as we settle in to enjoy the rolling Missouri hills that make this area so beautiful and fun to ride in. We will stop and see the famous World’s Largest Rocking Chair in Fanning, wind our way on the twisting roads of Devil’s Elbow! We will stop at Gay Parita’s,a Route 66 icon. Tonight we will enjoy a stay in Joplin, a city that was hit very hard in 2011 by a massive tornado. We’ll hang with the locals in the small downtown area and hear some amazing stories about what it was like to be in the eye of a massive tornado! Today you leave Texas and are on your way into “The Land of Enchantment”, New Mexico – after passing through the world famous Cadillac Ranch. How about the ghost town of Glen Rio, where you can stand with one foot in New Mexico and the other one in Texas? From there we enter the land the Comanche Indians, where mesas, mountains, cactus and pines define the landscape as head up into the High Plains and altitude of Santa Fe in central New Mexico. Santa Fe is one of America’s oldest and most beautiful cities, and will be our base for the next two nights.